Six-guns vs. werewolves in the Old West! "In our mythos of the Old West, there are bad guys and even badder guys. But Eric Red's are the biggest, baddest guys of all..."
"With THE GUNS OF SANTA SANGRE, Eric Red delivers a wild mash-up of action-thriller and bloody horror. This one really digs its claws into you from page one to last bite. Fast, furious, and wickedly fun. Highly recommended." "It's THE MAGNIFICENT SEVEN meets DOG SOLDIERS! Taut, action packed and gory as hell! I couldn't put it down!" "THE GUNS OF SANTA SANGRE is an old-fashioned, well-made dime novel, doing Louis L'Amour, Elmore Leonard and Richard Matheson proud." 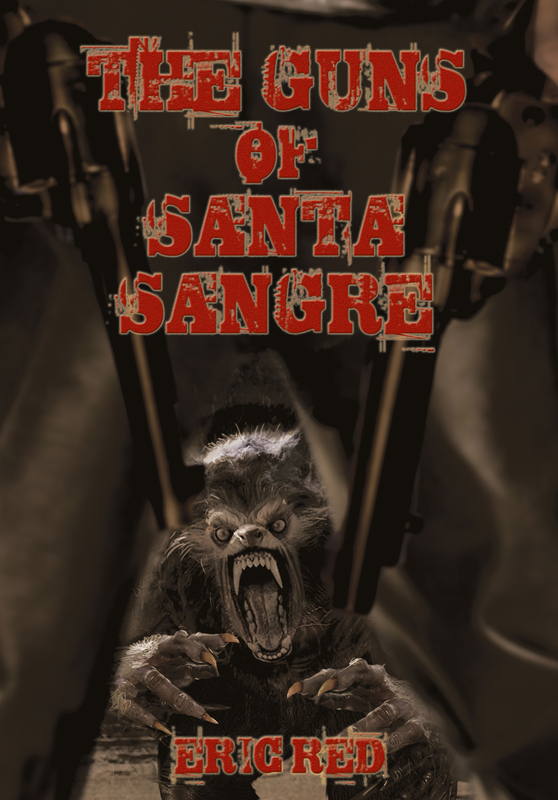 "Bloody fights, desert vistas, a touch of romance, and plenty of werewolf action make THE GUNS OF SANTA SANGRE a fast-paced adventure. Screenwriter and author Red (DON'T STAND SO CLOSE) delivers a supernatural Western that should appeal to fans of the growing 'weird West' genre." "Imagine THE MAGIFICENT SEVEN mixed with DOG SOLDIERS and you've got Eric Red's THE GUNS OF SANTA SANGRE. It's full of classic horror moments, non-stop action, and characters pushed to the edge. Three outlaws are hired by a young woman to protect her village from what she claims is a pack of werewolves. Seeing it as an easy job for three gunslingers looking to make some quick coin, they begin a journey that will forever change the way they see the world. Filled with action set pieces and terrifying monsters that are ready-made for big screen adaptation, GUNS is a fun and exciting read that no horror fan should miss." Quick, smooth, easily read, an almost filmic rendition of the time-honored traditions of the Western, with a deftly handled incursion of the unnatural, with the two blended into a single, intriguing story." "I really like the trend combining horror with Westerns and THE GUNS OF SANTA SANGRE increases my confidence in this surprisingly popular sub-genre. I thoroughly enjoyed Red's novel with its flawed heroes and the savagery of the werewolves. If you have yet to read a horror Western, this is a good book to start with." "THE GUNS OF SANTA SANGRE is a fast paced, action packed, blood soaked novel that I'd thoroughly recommend."